An Independent chapel, allied to the Countess of Huntingdon's Connexion was built here in 1775 at the expence of John Henshaw, attorney, and opened on 20th August of that year. It became fully Independent c.1792. The chapel was much enlarged in 1834 at a cost of �000 (when the present front was probably added) and re-opened on the 25th November of that year. In 1851 the chapel had a circular gallery, and seating for 500 worshippers. On Census Sunday 30 March 1851 there were 206 worshippers at their morning service and 209 at their evening one. In addition there were 66 Sunday scholars. It was restored in 1873 at a cost of �0 and a manse was built. 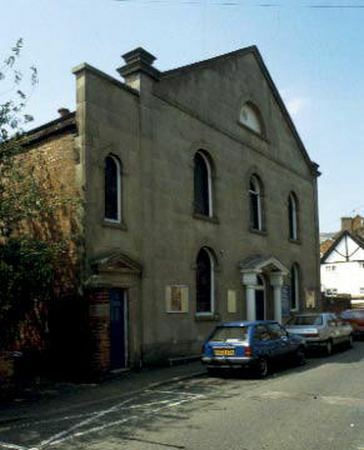 The congregation joined the United Reformed Church in 1983, and by 1992 had joined with the Methodist Church in Wem, q.v. This chapel was taken over by the Baptists c.1991. For a view of a window and the brickwork on the south side of the chapel, click here.